The Gidda is a popular folk dance of the women in Punjab and is a way to exhibit teasing, fun, exuberance of the life in Punjab. This dance is equally energetic to the Bhangra and at the same time, shows the grace and femininity with elegance and elasticity. The dance is done to the rhythm of clapping hands of the women and a small dholak or two sided drum is used to give beat for the dance. 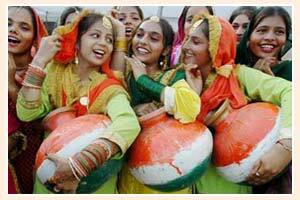 The dance is done to small couplets that are sung by the women. They wear long tunic tops coupled with skirts or Salwars. Also, the women adorn themselves with a lot of jewellery and also wear tassles in their hair. The dance is done in a ring in which two women come and dance in the centre while the remaining women sing the couplets. Expression of excesses is done in the dances and also, mimicry is a very important part of Gidda.